Today, Windows 7 is still a popular operating system for most users. Many new computer apps or say the newest version of the apps will occupy a lot of volume. And with time goes by, the C drive may run out of space. So it is necessary to extend the system partition to make the system runs normally. Now that you have known what reason caused the question and planed to solve the problem, you need a tool to do this. Although Windows 7 has a snap-in tool called Disk Management, which can help you to extend C partition only with an un-allocated space adjacent to it. If there is no unallocated partition, the Extend Volume option would be grayed out, the built-in tool can’t help you any more. But, third-party Windows partition manager has the solution. For example, AOMEI Partition Assistant, could expand the system partition with at least three methods without losing data. In fact, AOMEI Partition Assistant is very easy to use, no need to learn professional computer knowledge, just click and click to let the software to commit the task. 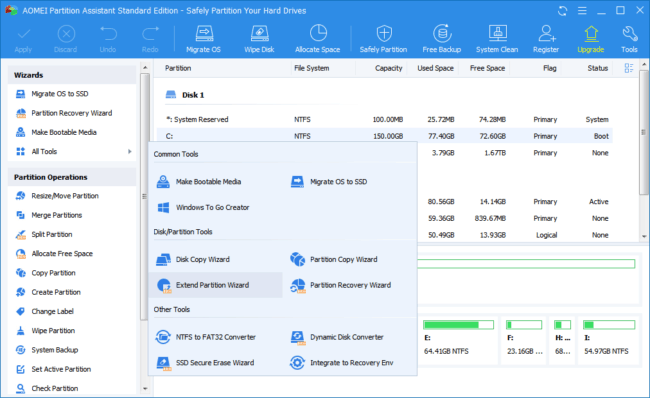 You can download the free partition manager – AOMEI Partition Assistant Standard Edition to try and enjoy it first. If you are not in a hurry, please read on, I will show you its functions with screenshots. Launch AOMEI Partition Assistant, you can see its main interface as following picture show, clear and light blue. If there is an unallocated space near to the C drive, right click the C drive and select Resize Partition to go is one method. AOMEI Partition Assistant’s Resize Partition feature can also extend partition if there the unallocated space isn’t next to the C drive, the software is very intelligent. The second way is Merge Partitions. Combing the partition near the system partition, all data in one partition will be merged into another one. 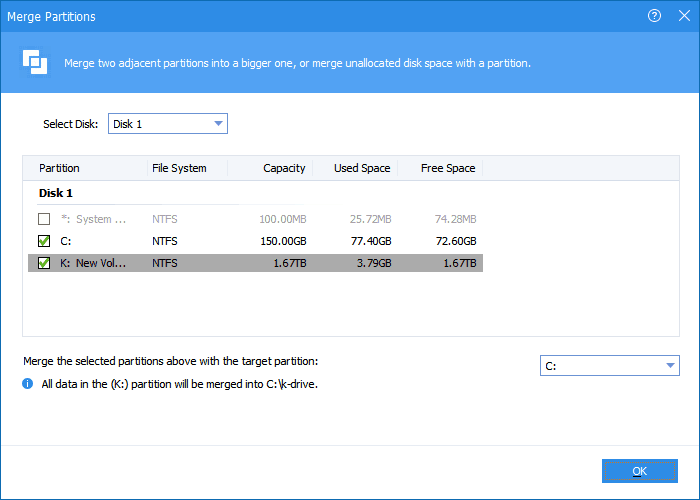 Merge Partitions also support merging any unallocated space. From left Wizards panel, open All Tools, you can find Extend Partition Wizard, just follow it to extend system partition step by step with guides simply. All operations in AOMEI Partition Assistant can preview the changes before applying, thus, it is safe. As an all-in-one partition manager, AOMEI Partition Assistant has other functions like migrate OS to SSD, create bootable media, split partition, wipe partition, and so on. AOMEI Partition Assistant also works on disk too, such as rebuild MBR, convert to GPT, disk backup, etc. The software is powerful and small size, install it in your computer and use it to optimize the system is a wise choice.